Barra on Saturday: "When I look at our footprint, there is so much more work and negotiations to be done on NAFTA." At an event to introduce GM's 2019 Chevrolet Silverado pickup ahead of the Detroit auto show, Barra twice did not answer directly when asked if the automaker is reconsidering current production in Mexico in light of potential changes or the collapse of the trade deal between the United States, Canada and Mexico. Fiat Chrysler Automobiles NV said on Thursday it will move production of its next-generation heavy-duty pickups to Michigan from a plant in Mexico, a move that reduces the risk that those trucks would be hit with a 25 percent tariff if NAFTA unravels. In a separate exchange with reporters, Reuss said GM intended to use its North American factories, including those in Mexico. General Motors is also shuttling unfinished older model pickups to its plant in Oshawa, Ont., from Fort Wayne, Ind. The automaker will continue making the outgoing model of the Silverado and Sierra — and finishing them in Oshawa — until market demand subsides, the automaker previously said. 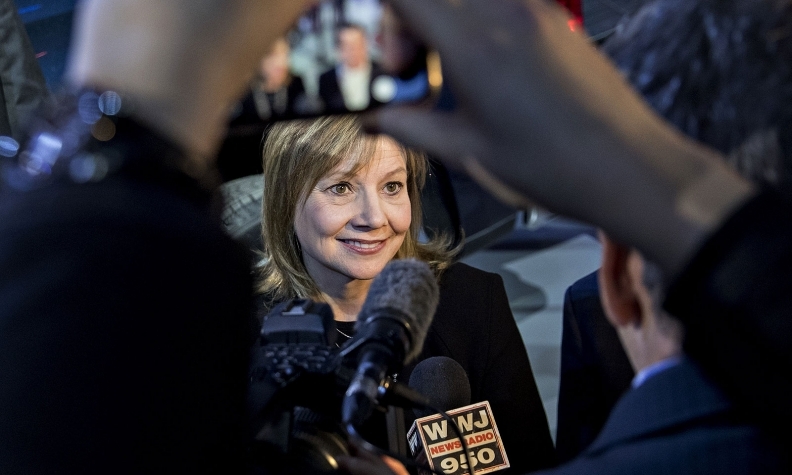 Barra, who met in November with Vice President Mike Pence along with other U.S. auto executives, said GM has been working to educate the Trump administration about the complexities of the auto industry and its supply base. "We're going to continue to work constructively to get a modernized NAFTA agreement," she said. Barra said she was optimistic that NAFTA would survive. President Donald Trump has threatened to walk away from the 1994 accord unless major changes are made in negotiations with Mexico and Canada. Other GM executives defended the company's North American manufacturing strategy, saying 80 percent of the trucks sold in the United States are made in U.S. factories. GM North America President Alan Batey said GM's Mexican truck plant supports U.S. jobs. "The truck we build in Mexico, the engines come from the U.S. Everything is interlinked," Batey told reporters after showing off the new Silverado. Asked what GM would do if the United States pulls out of NAFTA, Batey said GM would "have to worry about that when we get there."